Belly-Up has proved itself as an efficient fly for different predators of the Far East: pike, catfish, taimen, snakehead, and lenok. Pike prefer red, pink, orange, and chartreuse Centipede flies with total length 8-10 cm. In some cases this fly was causing more pike attacks than big streamers or any spinning lures. 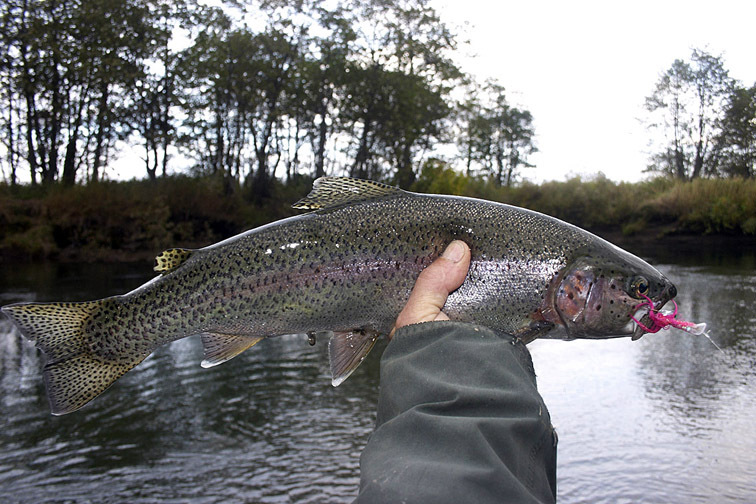 It is also an excellent choice for Pacific salmon (for instance, coho), rainbow trout, char, and grayling. 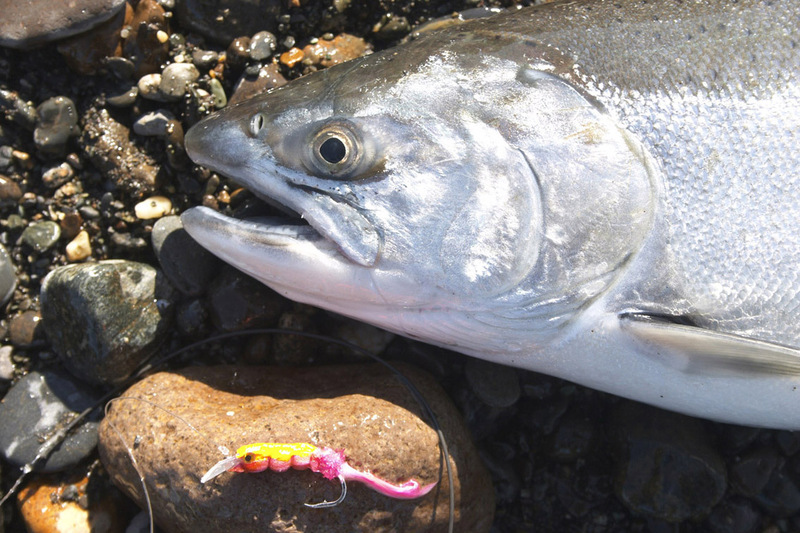 For the Pacific salmon and char the flies with the total length 5-7 cm on the #6-4 hooks in pink or purple colors are the best. If you aim at grayling and char only, the best flies will be 3-5 cm long pink ones on the #10 or #8 hooks. The coho from the Kamchatka Peninsula is not very eager to strike the regular salmon flies. On the contrary, the pink or purple 5-7 cm long Belly Up is the best fly for this picky fish. The Centipede is catching lots of pikes. Lenok was interested in the medium size (6-7 cm long with the tail) red-blue Belly-Ups. The smaller (3,5-4,5 cm) bright flies were also working well. These one were also catching bigger specimens of the Amur grayling (image by Igor Tkachenko). For rainbow trout and sea-run Pacific salmon the 5-7 cm pink Belly-Ups on #6-4 hooks were the best. The same flies were also catching lots of bigger size grayling and sea-run char. The best grayling and char flies are a little smaller — 3-5 cm long, on #10 and #8 size hooks. 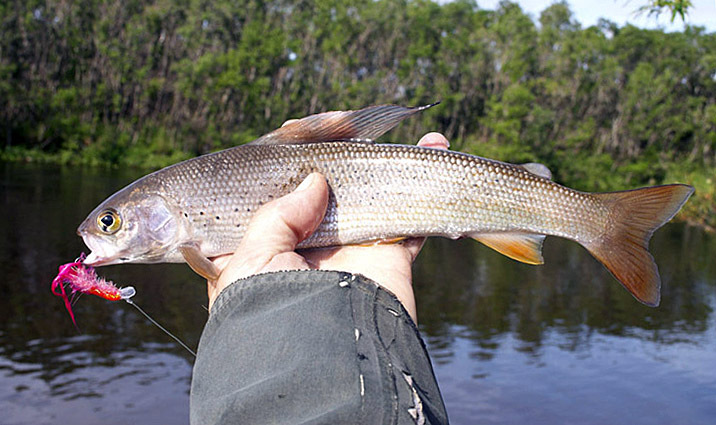 Diverse non-salmonid predators of the Amur River such as skygazer, Mongolian redfin, or Mandarin bass are easily caught with the Belly-Ups as well. The best patterns were 6-7 cm long flies on #4 hooks; the light colors work the best: silver, pearl, light pink, and yellow. Skygazer was attracted by a wiggling imitation of an unknown pink fish. In 2011 I was testing the Belly-Ups in the Bering Sea. In the catches there were different flounders, saffron cod, greenlings, and sculpins. The wobbler-flies make much stronger signal to the fish which sometimes could be exactly the difference between the win and failure. This is especially important when fishing during the flood or in the permanently murky river. A true advantage of the use of a Belly-Up or other «active» fly with a blade instead of a regular streamer is a possibility to catch a predator with a fly of much smaller size. So, one could use the light tackle instead of a heavy one. 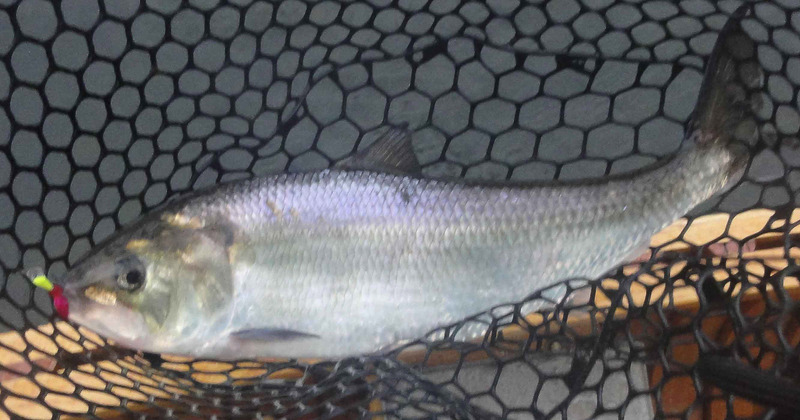 This shad was caught in May 2011 in the Delaware River. 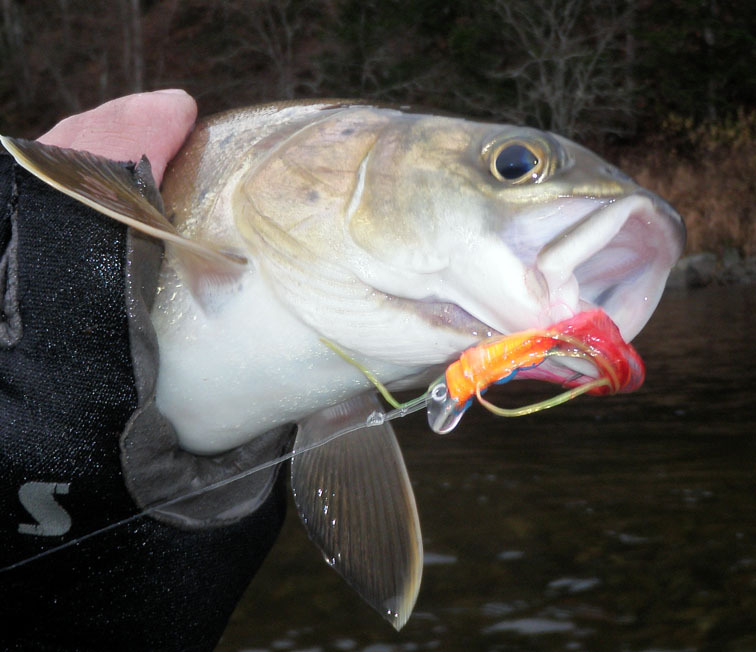 The tiny bright Belly-Up is an excellent attractor pattern for this non-feeding fish.